Home at last from all our spring travels. And the studio is ridiculously clean! I’ve abandoned all sculpture work for now. My heart isn’t into it and that’s why the Virtu sculpture is 100% not happening. I only wish I had recognized this before I went through all the time and expense to make his waste mold etc. But I did contract for a table at Breyerfest’s artisan gallery for 3 nights in July. I don’t have a new sculpture to introduce, so I’m going to spend the next 6 weeks glazing chinas. Based on the enthusiasm for custom glazed Hagen-Renakers at the recent Clinky Mayhem event, I decided to get out some of my remaining stash of H-R bodies and glaze them to sell. Plus a few other pieces if I have time. Also a Roundabout Cob in chestnut with a fun white pattern. I’ve also begun a bone china Boreas which will be a very dark dapple grey, almost black. Plus an H-R Ferseyn in silver bay and Sheba in chestnut sabino. We’ll see how many I finish in time. 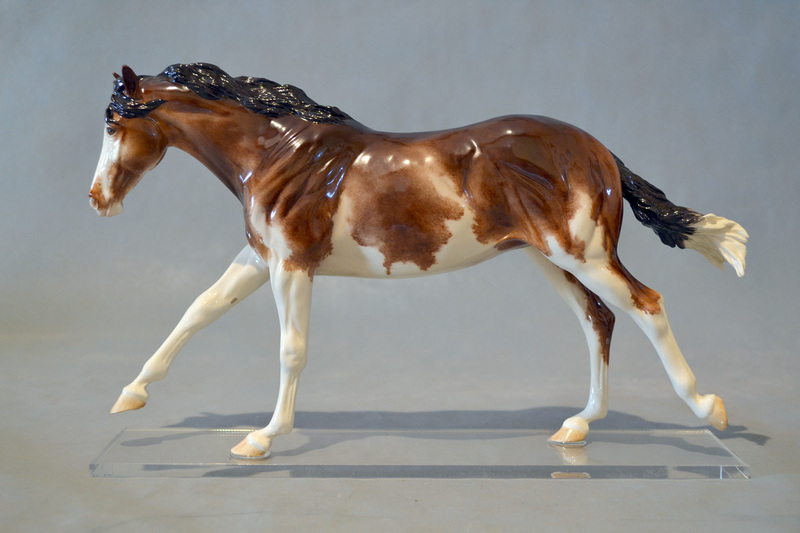 They will be sold first-come, first-served at the Breyerfest Artisans Gallery starting Thursday night July 12. Here’s a link to the AG info. I will also be bringing my overglaze paints/palette and a white china horse, and I will be demo-ing china painting the three nights I’m there. I hope to see you! Roan Lady auction, a big shock! I feel a bit crazed, because the auction for the custom glazed Roan Lady began and ended even before I wrote the blog post meant to announce it! I published the auction page, posted the link to Facebook, and then was in the middle of typing this blog/notification post, when I received a bid for the auction-ending Buy It Now option. I swear that I put what I thought was a very high BIN price. I really really didn’t think it would go. I guess I did not gauge the market very well. Here is the auction page. I will get right back to glazing more stuff!! Plus my new sculpture is going well! 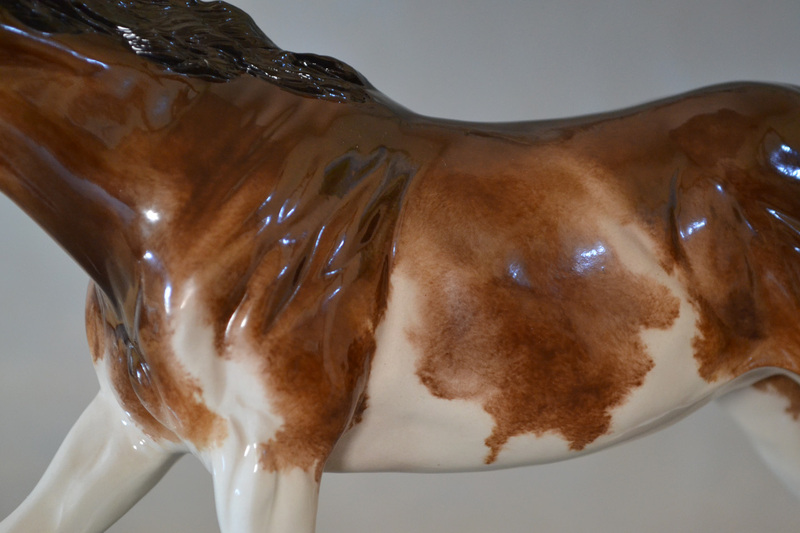 Update on the custom glazed dapple grey Hagen-Renaker Roan Lady china. It will be finished this weekend. Only the hooves and a few minute details remain to be painted. I will be putting it up for sale in a website-based auction in the same way I sold a china Streetwise a few months ago. (Go to the link here to see the rules for bidding in that auction. The RL will be similar.) For this piece there will also be a pricey buy-it-now, paid in full option. The buyer will be able to choose the colors of the mane and forelock ribbons. I’m away for several days next week in a backcountry mountain hut with no communication. So the auction most likely will start on Friday the 12th and run about 3 days. I will post the official link here and to Facebook, when it goes live. Thanks SO much for all the interest. I’m a fool for letting this one leave, I think! Lynn left the greenware Pepé with me, and he’s been here ever since. I’m determined to make a dent in the glazing of my “stash” of white china ware, so I have glazed this guy in the past month. He is a nicely shaded dark reddish bay tobiano. A lovely part-Arab. Because this was a piece intended for practice, I am sure he’s not detailed-out to Lynn’s normal very high standards. Still, the casting is overall fine and crisp. The extended foreleg had a break in greenware, which I reattached (while still in the greenware stage) as a part of the learning process, and it looks good and is strong. But the leg lacks some of the detail it should have because it’s hard to resculpt a delicate area like that, and I think the hoof is rotated out to the right just a tad. Lynn’s website says the Pepé edition is dated 2009 but we met in Fall 2008; either way it means this sculpture is nearly 10 years old and I’m guessing there haven’t been any new ones in china produced recently. I don’t know if the china edition is closed. I asked Lynn for information about the china Pepé edition; she’s traveling and I didn’t want to pester. But I also didn’t want to wait any longer to try to make a sale because we’re into the crazy holiday shipping season and I don’t like to ship a china any later than about the first week of December. I’ll update this page/forward to the buyer any edition info I receive. Lynn and I each will get half of the sale price. It will be sent FedEx unless you tell me otherwise. Please make an offer if you’re hesitating about the price; it was hard to know what to ask for an item like this one. I can be open to time payments, send in your proposal. To buy, Email Karen. My thanks to everyone who took an interest in the earthenware custom Streetwise in sabino last week. It turned out to be a great fundraiser for a very nice model horse event. Now, here is the second in a china trio of this sculpture that I have been working on this summer. 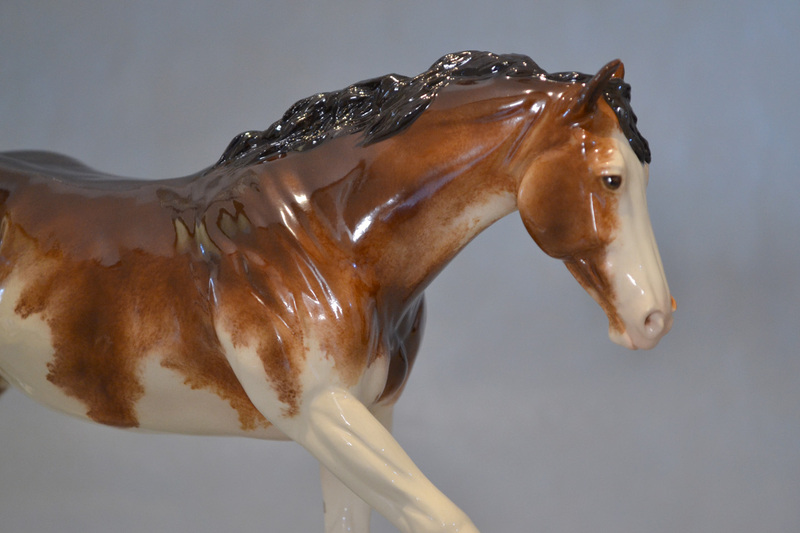 This is my Streetwise Quarter Horse sculpture. Cast from his ceramic molds by me in highest quality earthenware china, and then resculpted at the greenware (unfired) stage. He has been given a braided mane and tail, resculpted head including eyes, ears, and muzzle, repositioned legs, and enhanced/added sculpting of the body musculature. After firing to bisque, he has been glazed to a deep, deep, shaded red chestnut. The “red” palette in the new overglazes I’ve been using for a couple years now is just fabulous and I have to resist putting this color on everything! This piece has been permanently fixed to a beautiful and lightweight clear acrylic plinth, using super strong, two-ton clear epoxy. This is earthenware china Streetwise #3; which means that so far only three have been produced in earthenware china. One more to follow, and then I’m very done with these for a long while! They are difficult to produce and I have to hold my breath the entire time they are in the kiln or being handled. I am offering this piece in a first-come, first-served sale: $575.00. Fedex shipping (in USA) and overseas postage is included. Preference given to someone who can pay in full. However, I do offer a payment plan of 60 days. Time Payment Terms: You first send a non-refundable deposit of $100.00 VIA PAYPAL ONLY, within 3 days. The balance must be paid off by November 10, 2017. No exceptions or extensions. All other payments after the deposit can be made by personal check/money order if desired. You can make payments during the 2 months on any schedule you set. You can wait and pay the entire balance on Nov 10th if you like, etc. If you do not pay the full amount by Nov 10th, the right to purchase will be revoked, the amount you have paid so far will be returned, and your DEPOSIT will NOT be REFUNDED. If you are interested in purchasing, email Karen. Just a reminder that the bay sabino claybody custom china Streetwise auction ends in just about 2 hours, at Noon mountain time. Here’s the link to the auction bidding page. The current high bid is $600. The auction ends on Saturday September 9th at Noon MST. Go to this link for the auction web page.